Stone is better than your favorite local brewery. Unless you live in Milton, Delaware, or Bend, Oregon, or maybe Northwest Tampa, that statement is just true the way it’s true to say that Pope Benedict is a religious kind of guy or that Alex Rodriguez is a little misguided: a vast understatement. I’m currently preparing a post called “America’s Best Beer Regions” and realized that, being brutally honest, the seven of the ten regions would have to be Out West. It’s just a fact that breweries become better over the long arc of a thirty year history than one that’s been around for three, five, seven years. Stone has been at it, now, for twenty years and, while they were good almost immediately, they are flatly spectacular now. I’m certain that Steve Gonzales, head of Stone’s small batch experimental brewing department, occasionally sees a test batch or two that just doesn’t work but whatever makes it into a Stone package is going to be exquisite. EX-QUIZ-ZIT, no exceptions. So when Mitch Steele and crew decided to amp up their immortal Old Guardian Barleywine with a mega-dose of florid Northwest hops, as part of their “Odd Beer for Odd Years Series” in 2015, those of us who are long-term Stoneites had no doubt…but the reality of it – the liquid in the glass and on the tongue – is FAR better than we ever even hoped. 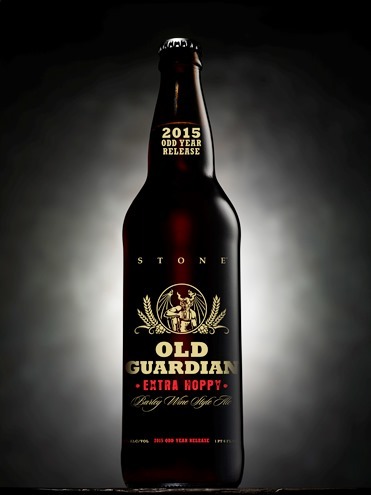 And here it is…Stone “Old Guardian Extra Hoppy” Barleywine 2015 is…wicked great. No debate possible. This stuff Works harder than a first year clerk at an understaffed law firm; retaining that chewy, rib-sticking core of intoxicating malts and adding several new layers of resiny brilliance, courtesy of an assertive dry-hopping with a new variety, Azacca…a dwarf variety newly developed in Yakima Valley, Washington, and formerly known by the far more prosaic laboratory designation, “13-AD-483.” Azacca, all evidence suggests, may just be the Next Big Thing and is definitely a perfect companion piece for Barleywine-style beers. Bright, dizzying notes of crisp citrus, aromatic cedar and spruce, pineapple, and bitter orange cavort shamelessly atop that viscous bed of malts and gives this style – which is frequently mishandled by less-experienced brewers to produce something ponderous and leaden – a brisk, snappy acidity and a literally mouth-watering finish that’s awash in spices and candied citrus fruit peels. 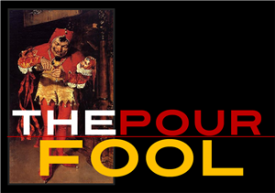 This is a logical and completely convincing advancement in the Barleywine style – well, it is if you’re Stone Brewing, it is. Lesser brewers wouldn’t even try this – and, as with all Stone’s frankly brutal editions of hopped-up ales, it also manages to remain remarkably drinkable and definitely doesn’t wear out its welcome easily. I suppose I could finally drink enough of this stuff to become a little jaded about it…but I suspect it would take an amount of time that’s measured in decades. If you don’t like Barleywine but you love big IPAs, you probably just haven’t found the right Barleywine, yet. I’m betting this is It.